Sample provided; this post contains affiliate links. Now that my wedding is over, one of the many (many!!) projects on my to-do list is getting my favorite wedding portraits printed. We had Portland-based photographer Jason Hill at our wedding, and Jai and I got some wonderful photos both of ourselves and our family during the big day – I’ve picked out 9 different family portraits that I want to hang in our house. I’m a big fan of getting photos put onto canvas; it turns your photo into an art piece and really looks beautiful on the wall. Having a print made allows you to enlarge the picture to bring attention to it and really capture details and photo quality that would not be visible in a small printed photo. This is a kitchen table that belonged to my parents, which Jai resurfaced before the wedding. We used this table during the ceremony to sign our marriage license, and since we got married during the solar eclipse, Jai used a magnifying glass during the partial phase to burn our wedding date onto the table. He does a lot of woodworking and has built much of our furniture by hand, so I decided to hang this portrait over a mantel-style shelf that he built in the living room. Ordering this print was super easy – the process of uploading your photo and selecting the style/display options is very simple. The shipping was lightning fast, arriving exactly one week after I ordered it. It turned out beautifully and will be something we enjoy in our home for a lifetime! PhotoBarn also has a lot of deals to help you save some cash. 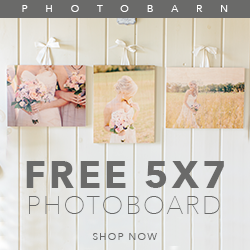 If you click on the banner above, you’ll be able to get a free 5×7 PhotoBoard – all you pay is shipping. I actually took advantage of this deal myself last week and snagged a PhotoBoard with one of my bridal photos that I’ll be using as a Christmas gift! Shipping is a standard rate of $9.99 and is listed clearly on their website, so there are no surprises – many other canvas sites that I’ve been looking at lately don’t even list their shipping prices, and offer “Free” canvas prints with high shipping costs. So recent brides, take note! Did you have any of your wedding photos put onto canvas? I loved visiting Hard Rock Casino Punta Cana. The hotel was as beautiful as the beach.